Techinline FixMe.IT is a product that enables remote troubleshooting and users can view, diagnose, and resolve problems on computers located in any location around the world. The specialist can be located anywhere, but the app makes it look like he or she is working on two machines placed on the same table. You only need an internet connection and browser to launch a Techinline remote session between any two computers. Thus, it is an ideal app for instant access and on-demand customer support. Simply log into your Techinline account online to start the support session, then direct your customer to techinline.net to get a 6-digit Client ID number. Enter this number in the corresponding field on your end and start resolving your customer’s technical issues. 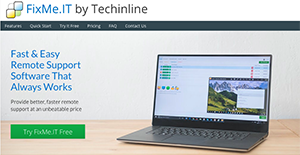 Reviewers regard Techinline as an easy-to-use and reasonably priced alternative to some of the complex and expensive remote support tools in the market. What Problems Will Techinline FixMe.IT Solve? Client located in a different region or country requires immediate technical support with their machine. The expert (account holder) connects to their machine using Techinline and resolves the technical issue remotely. Techinline can be used to share own desktop with a remote party. This makes Techinline an effective solution for remote training or demo purposes. The expert can share their desktop view/control with the remote party and demonstrate a project or operation on their screen. Techinline can be used for unattended access. The expert can connect to clients’ machines during after-hours to provide maintenance and support in the client’s absence. Since each enterprise has specific business requirements, it is prudent for them to refrain from searching for a one-size-fits-all ideal software application. Needless to say, it would be useless to try to find such a system even among widely used software platforms. The clever thing to do would be to catalog the various essential elements that need consideration such as key features, finances, skill levels of staff members, company size etc. Then, you should do your homework thoroughly. Read some Techinline FixMe.IT reviews and look into each of the other apps in your shortlist in detail. Such comprehensive homework can make sure you weed out ill-fitting systems and zero in on the solution that provides all the aspects you need for business success. How Much Does Techinline FixMe.IT Cost? We realize that when you make a decision to buy Remote Support Software it’s important not only to see how experts evaluate it in their reviews, but also to find out if the real people and companies that buy it are actually satisfied with the product. That’s why we’ve created our behavior-based Customer Satisfaction Algorithm™ that gathers customer reviews, comments and Techinline FixMe.IT reviews across a wide range of social media sites. The data is then presented in an easy to digest form showing how many people had positive and negative experience with Techinline FixMe.IT. With that information at hand you should be equipped to make an informed buying decision that you won’t regret. What are Techinline FixMe.IT pricing details? What integrations are available for Techinline FixMe.IT? If you need more information about Techinline FixMe.IT or you simply have a question let us know what you need and we’ll forward your request directly to the vendor.